Incredible tube versatility for studio and practice use. Get an arsenal of killer tube amp tones at your fingertips, direct, into a cabinet or through headphones for recording and practice. 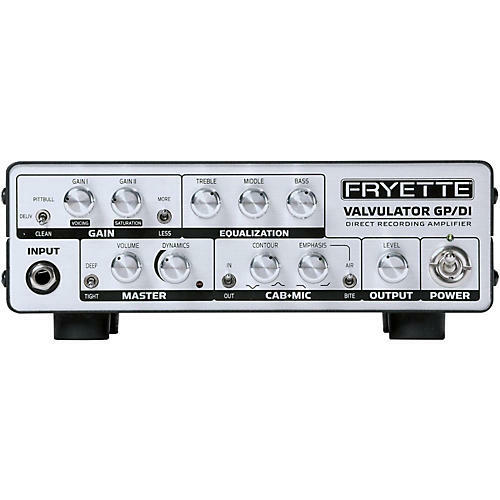 Introducing The Fryette Valvulator GP/DI, Direct Recording Amplifier. The Valvulator GP/DI is a direct recording solution featuring an ultra-flexible All-Tube one watt amplifier specifically designed to deliver genuine dynamic tube amp sound and feel direct to mixing console, DAW, or other computer interface for recording - and direct to FOH/Monitor board for live performance applications. The Valvulator® GP/DI can also be used as a tube direct box, a stand-alone guitar amplifier, preamplifier, and all-around low-volume-playing solution. Record a real cranked tube amplifier into a mic'd cab at speaking volume? Dial in your ideal amp/cab voicing without the need for external cab sims or digital modelers? Practice and rehearse your own tracks with headphones utilizing your favorite external reverb with genuine high-voltage tube dynamics and sustain? Run your favorite boost or fuzz pedals into the front of the GP/DI for practice or recording? Record and save your unaffected guitar performance independently of your fully processed track for later re-amping or reprocessing? The new Fryette Valvulator GP/DI allows you to do all of this, and more. How is that possible? Steven Fryette has created a genuine, all-tube, one watt guitar amp, driving an internal reactive load and an analog speaker simulator. The unique, tunable Cab+Mic feature allows you to shape the internal cab tone and dial in high frequency microphone response, providing the critical mic proximity behavior not found in any IR based cabinet models. The result is a recorded sound and touch sensitivity not possible with modeling gear alone. And if you do want to utilize an external IR cab model, you can simply disable the Cab+Mic function using the front panel bypass switch. The proprietary Fryette Valvulator tube buffer/direct feature allows you to send your unprocessed pickup level guitar signal directly to your recording interface. Or you can connect this signal path directly to the front end of any modeling product to improve the tone and dynamic performance of any modeler. The Valvulator GP/DI has many functions and most of them can be performed simultaneously! Every output has a signal present as long as there is something plugged into the front panel Input or rear panel Auxiliary Input and the front panel controls are set accordingly. All Tube 1-Watt amplifier with integrated reactive load: Powered by four dual triode tubes, the Valvulator GP/DI delivers 1 watt or more into an 8 or 16 ohm speaker cabinet. The integrated reactive load is engaged when no speaker cable is connected to the speaker output jack. This is ideal for silent/direct recording, slaving to a larger amplifier or practicing with headphones and creates the reactive relationship between the guitar and the amplifier. The Valvulator GP/DI works with you, not against you. Broad tonal range with three tube amp voicings: The three voicings; Clean, Deliverance (old-school crunch), and Pittbull (modern up-front detail), are coupled with the two independent gain controls and the “More/Less” switch giving you virtually every level of performance you could hope for, from bell-like chime to massive gain. Fully functioning dry-tracking and re-amping capability: Guitar and bass players with digital audio workstations can use the Valvulator GP/DI’s Direct Out 1 to run an unaffected signal into a recording interface, or add warmth and gain to an already existing track by sending a dry track into the Aux Input of the Valvulator GP/DI for re-amping. Proprietary analog Cab + Mic simulator with “Air” switch: Fryette’s Cab+Mic simulation creates additional nuance to guitar tone that is typically produced by the way a speaker cabinet and a microphone work together in a room. Practice in silence with the headphone amp using dedicated stereo effects: The Valvulator GP/DI sends a mono signal to the FX Send and can accept a stereo signal to the FX Returns for use with external effects such as delays, reverbs and chorus pedals. Practice or record at low volumes with a speaker cabinet: Plug the Valvulator GP/DI into an 8 or 16 ohm cabinet for a 1-watt practice amp perfect for small studio recording. Dimension of product: 8.75 in. x 6.15 in. x 2.75 in.